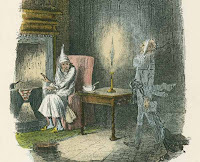 I have just learned of this marvelous site from the most recent posting at Dickensblog. A journalist for the Edmunton Journal, Rick McConnell, is currently publishing a serialized novel, Shadowing Dickens, which focuses on the writing of A Christmas Carol. Readers can follow the daily postings of this wonderful story here. The series started on Sunday, December 6, so there is plenty of time to catch up on the previous postings. I promise you will look forward to each new chapter. It is written very well – and is a sweet story of a young orphan named Alfy who meets Charles Dickens when the great author visits the orphanage that is located on the same street that housed Fagin and the Artful Dodger. Dickens is taken with Alfy and has just summoned the boy to his home so that he can get to know him better. I read A Christmas Carol every year with my 7th grade class and while I have only read the first four installments of this new serial, I am quite captivated by the premise of the book as well as the author’s writing style. It would definitely be worth your while to check it out this holiday season. And…if serialized novels are of interest to you, I also discovered a great little site while searching through blog postings this weekend. Mousehold Words is the name of the site and where you can subscribe to several of Dickens’ original works in serial form. You have the option of selecting how often you would like to receive the installments, from daily to once a month, and they arrive in your email box as a rich text attachment. Of course, Dickens is not the author that they feature. You can also subscribe to the works of Wilkie Collins, Alexander Dumas, and Sir Arthur Conan Doyle, just to name a few. I have always wanted to try to read some of these works in the original manner in which they were written, and I hope to utilize this site quite a bit in 2010. This story sounds wonderful. I am yet to read ACC but I am discovering Dickens this year so I am sure it will only be a matter of time. This sounds like such a great idea – how wonderful to be able to read the original serials in the way they were intended! What a cool discovery! Thanks Molly! You know, I've yet to read anything from Dickens. Yes, it is my backwards, uncultured youth's fault. I just ordered Great Expectations on audio though. I love it! what a terrific way to read Dickens and other classics. And that's the way Dickens started, right, being serialized? Neat! What a great find. THanks so much for sharing it with us.